Using Pro Chem’s Textile Paints and canvas along with other fabric you bring from home, each participant will create work that portrays an idea from within. I will share samples of my work, discuss how I find inspiration for my quilts, show how one piece leads to another and how to ‘listen’ to what your work is telling you, and review basics of good composition and design. 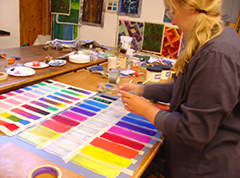 Process is the key to my work, and I will share the ‘how’ with each participant in the group. 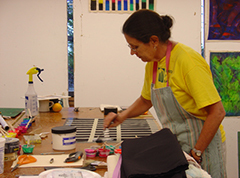 You will each paint, play, explore, and sew, creating two or more quilt tops by week’s end. There will be exercises employing line, shape, and color to lead you to create your personal work. The group will paint half the time and sew half the time, though each participant will work at his or her own pace. We will also learn how to look at the finished results individually and as a group, establishing a way to be objective about our own and others’ work in order to use constructive criticism as a positive tool. We may also discuss any other topics of your choosing - i.e. commission work, making a living as an artist, etc. Having been an artist all my life and an art quilter since 1983, I’ve come to realize that my art is all about process. Whether I am airbrushing, spreading textile paint on fabric taped to my table top, hand quilting, or weaving painted acetate through netting for one of my large kinetic sculptures, I am responding to that voice within that tells me that today, it’s time to create. If I do not hear that voice clearly, I know it’s time to write an artist’s statement, to send out some images, or to continue that workshop or commission proposal...or to drive to the beautiful Maine coast and just breathe. Viewers have often said that my work has an architectural sense to it. Perhaps this has to do with the fact that I worked as an architectural designer for eighteen years. Or perhaps it is simply my love of geometry, spacial ambiguities, layering of transparent and translucent planes, and contrasts in temperature. I look forward to the last steps in the making of a quilt: the hand quilting and embroidery. This final and very meditative process allows me to become physically reacquainted with a work created at arm’s length on the wall. The simple, repetitive act of stitching adds another visual dimension to the work. The details often surprise me. Elizabeth Busch is an internationally renowned artist who has a BFA from the Rhode Island School of Design. She has been making painted quilts since 1983 and has been making a living as a self employed artist since 1987. Her ‘personal quilts,’ which is what she teaches, feed her soul. From such work she has won numerous awards, including the Best in Show and the Quilts Japan Award from Quilt National. In 2009 she was given a retrospective exhibit at the Visions Quilt Museum in San Diego. She has taught workshops throughout the US and abroad since 1985. Her work has been exhibited throughout the United States, Europe, Australia, New Zealand, Canada, and Japan. She is the 2016 recipient of the Maine Crafts Association (MCA) Master Craft Artist Award. Recipients are selected for demonstrating excellence in craftsmanship, inspired design, a singular voice or style, and a career of service to the field. Plastic and/or metal putty knives..available in a variety of sizes at Home Depot, WalMart, etc. 3 yds. minimum 7 oz Unprimed Cotton Duck. Fredrix (www.fredrixartistcanvas.com) and Big Duck Canvas Warehouse (www.bigduckcanvas.com) are 2 sources. DO NOT WASH this light weight canvas!! I use a muslin color for all my quilts, but they also have white available if you wish. 8.5”x11” full page photo color copies of your 5 most recent pieces of work, if you have some. These images will be your own ‘gallery,’ to put up on your work wall, from which I can talk with you about your work evolution. 4 Table risers...we will be standing to paint a lot at our tables. The Maine Crafts Association announces the MCA 2016 Master Craft Artist Award Recipient: Elizabeth Busch, Quilt Maker, Painter and Sculptor, Arts Administrator and Educator. “Heat Wave” by Elizabeth Busch. 26”x70,” fabric painted with Textile Paints, machine pieced and hand quilted. The Maine Crafts Association announces the MCA 2016 Master Craft Artist Award Recipient: Elizabeth Busch, Quilt Maker, Painter and Sculptor, Arts Administrator and Educator, and the MCA 2016 Craft Supporter Award Recipient: Tammy Knight, Development Program Manager, Maine Made. The Maine Crafts Association (MCA), a statewide non-profit organization promoting the work of Maine’s craft artists, has named artist Elizabeth Busch of Glenburn, Maine as the 2016 recipient of the MCA Master Craft Artist Award. Recipients are selected for demonstrating excellence in craftsmanship, inspired design, a singular voice or style, and a career of service to the field. The 2016 MCA Master Craft Award process began with nominations submitted from past award recipients. The 2016 recipient was researched and selected by Diana Greenwold Assistant Curator of American Art at Portland Museum of Art. “Elizabeth Busch,” declares Ms. Greenwold, “is a multi-talented quilt maker, painter and sculptor whose body of work showcases a keen eye for color relationships and a sophisticated sense of composition. Though trained as a painter, Busch’s experience in architecture is evident in her numerous large-scale installations displayed throughout the United States. Composed of floating acetate in bold tones that are woven and suspended from the ceiling, Busch’s sculptures are designed to bend and flex with currents of air. These sculptures enliven libraries and lobbies in public buildings and bring jolts of color and motion to otherwise unoccupied space. 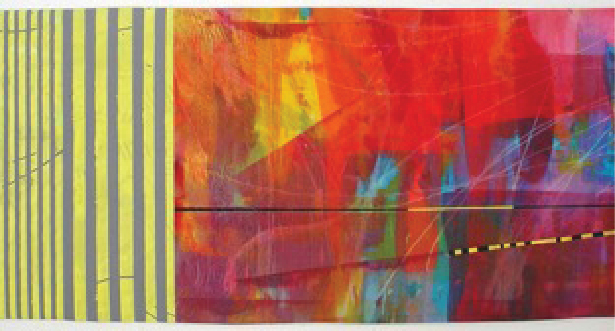 A pioneer in the field of textile art, Busch uses paints, dyes, and patchwork techniques to fashion lushly toned works. Her quilts pair bright hues and patterns against one another to create startling compositions. 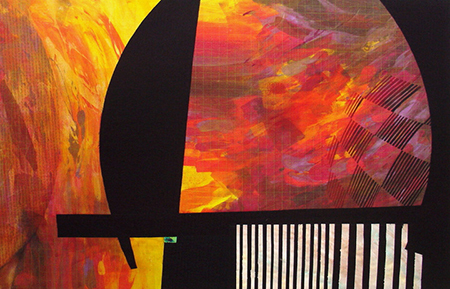 Busch’s quilts are composed of geometric forms in abstract compositions. Often painted, these art objects expand the bounds of fiber into the realm of painting and collapse distinctions between fine and decorative art. Busch is a lifelong teacher who has conducted numerous workshops in Maine, Canada, Australia, New Zealand, the Netherlands and throughout the United States. She has taught at the Haystack Mountain School of Crafts, in Deer Isle Maine, where she also served as the assistant director in 1989. In addition, Busch has led courses at the University of Maine and McMurry College in Abilene, Texas. Her ceaseless experimentation to develop new materials and techniques and her continued commitment to educating the community about her discoveries make her the ideal recipient of the 2016 Master Craft Artist Award.